DESCRIPTION: This is the arm shield of the Marine Brigade commanded by Lt. Cmdr. 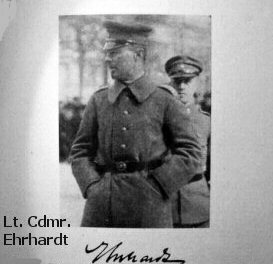 Ehrhardt. 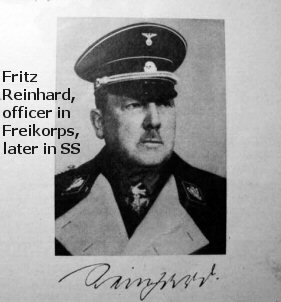 Several militias (Free Corps) were created by patriotic German officers in the 1920's and earlier to defend against a possible invasion by Russia, and later, to fight the communists of the domestic type. The red menace had tried to take over the German fatherland. 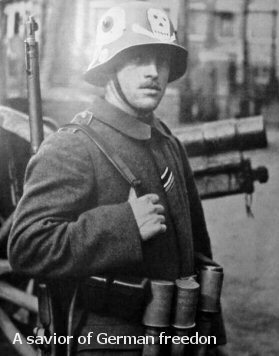 These Freikorps warriors were the single reason that this plan collapsed before the red scum could attain their bloody agenda at that point in time. 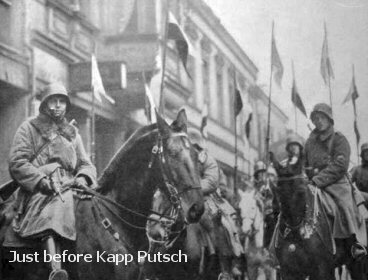 This Second Marine Brigade succeeded in taking Berlin completely in the Kapp Putsch of October 13, 1920. 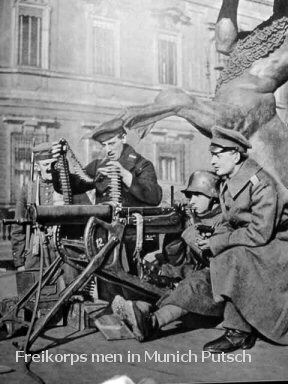 Later, they lost out to a general workers' strike, but other Freikorps jumped to the attack and later many of them joined the SA (Sturmabteilung) and their defeat was delayed until the end of WW II when the victorious western allies handed Germany over to the axis of evil! 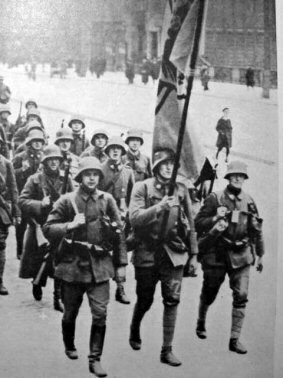 These Freikorps men were the bravest of the brave and this medal is a fitting though small memorial to their courage. 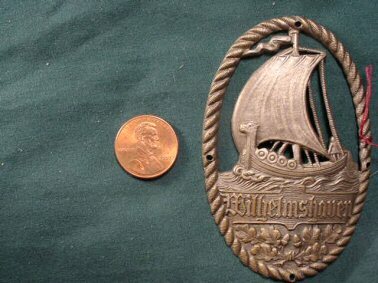 It measures 3 ¼ x 2 inches. The badge was meant to be sewn on the right arm of the military tunic. 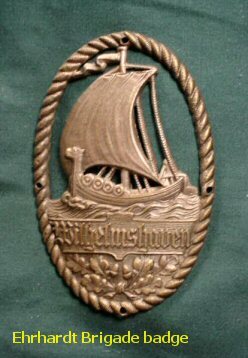 Very dramatic looking with its wonderful depiction of a Viking dragon ship sailing through the waves. Very rare and historically important. 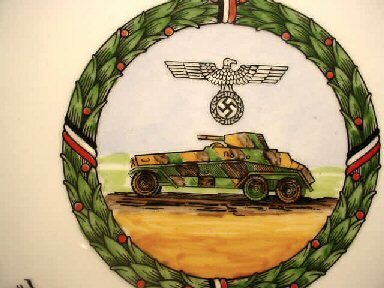 DESCRIPTION: This is an absolutely genuine hand-painted souvenir dish, WWII vintage. This is not one of the new plates done in England. 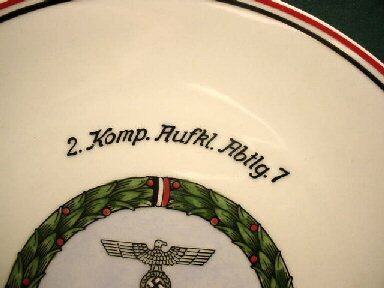 It commemorates service in the Second Company of Aufklarung Abteilung 7 and says, "In memory of my service time." It is very nicely done in vibrant colors. The edge has the black, white, and red national colors. 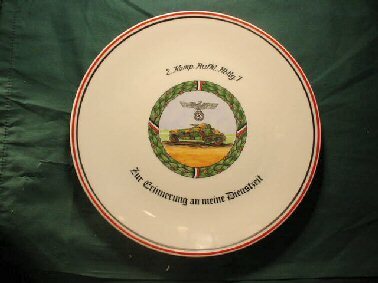 The plate is marked on the back and comes from the Deutsches Reichsbahn (the railroad system). 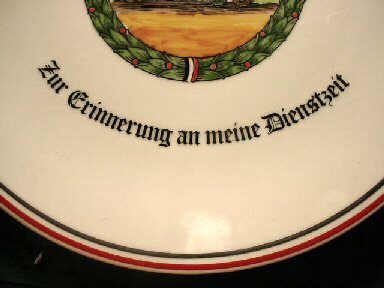 The plate, however, was not stolen from a dining car. 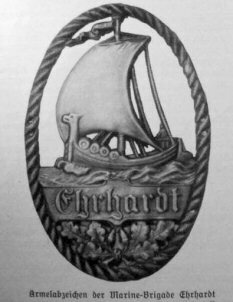 It was made up for the purpose of hanging and possibly distributed to soldiers for the express purpose of this artistic endeavor. 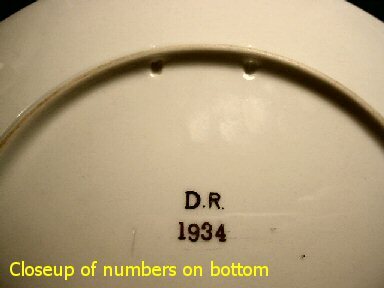 The 1934 on the back probably is not a date, but an inventory number. You can see the holes in the edge on the back to facilitate hanging the piece. This is a very nice historical remembrance and artistically good. 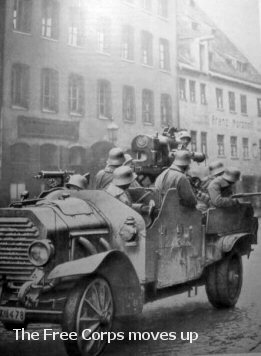 DESCRIPTION: One of the forerunners of the employment of airborne force, the Wehrmacht provided these elite troops with the best equipment German technology could produce, a good example of which was the specially designed paratrooper gravity-blade knife, an exceptionally practical item of rugged, but excellent quality. This one that we offer is also exceptional in condition throughout. Again, I hate to use the "mint" word, but since this seems to be an excepted phrase in our field I'd almost have to express it (this is mint!). 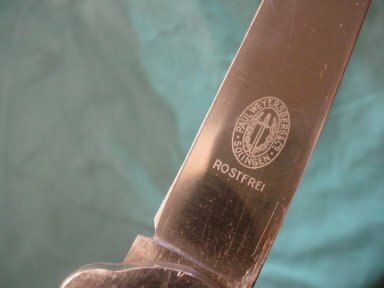 The blade is clearly marked Paul Weyersberg & Co, Solingen and the Rosterrei statement under the logo. The spring is quite tight and what can I say more? It is a honey! 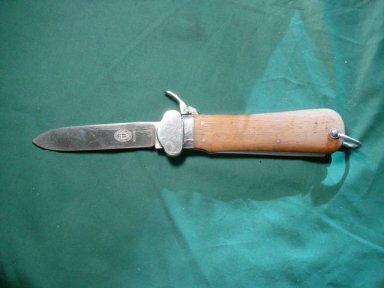 DESCRIPTION: This gravity knife is the type that could be bought by members of the elite paratrooper arm of the Wehrmacht. It is similar to the issue type except for the fact that it has some aesthetic appeal that is lacking in its predecessor. 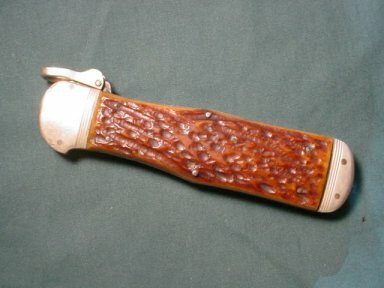 It has fine genuine stag grips that go far to beautify the piece. Its mechanism works much like the issue one where a lever is lifted and pressed thus enabling the blade to drop by gravity. Once out the blade locks and only releases to return when the lever is re-pressed. 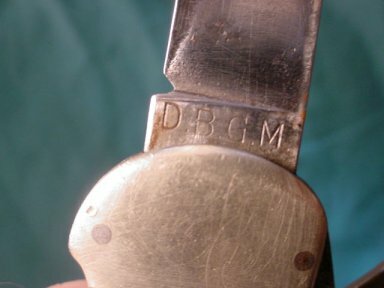 The blade has the "DRGM" marking at the base (no company mark is perceived). 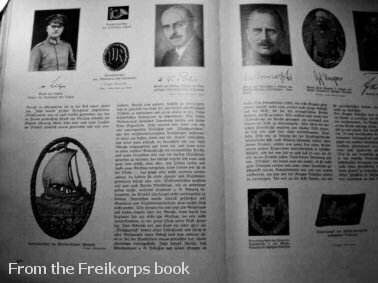 Many of these proud, elite troopers used to buy these "special" editions to carry; especially when showing off to the Fräuleins. Rare!